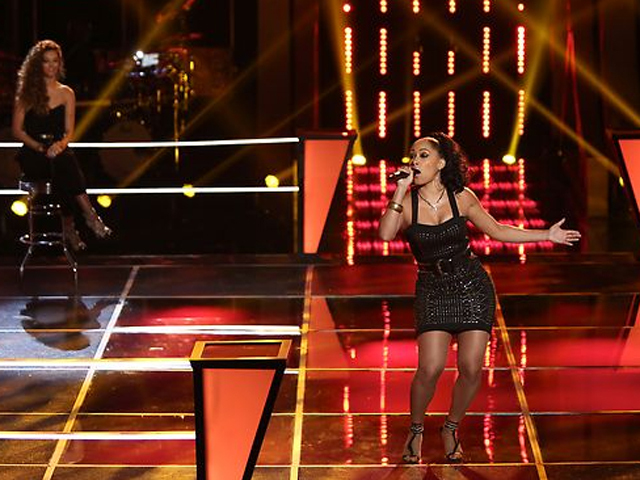 "The Voice": Who got knocked out in round two? It was a night full of tough decisions on NBC's "The Voice" on Tuesday, as Christina Aguilera and Blake Shelton both narrowed down their teams from 10 to 5. Both Adam Levine and Cee Lo Green whittled down their respective teams on Monday night, and now it was time to do some more cutting. Coaches had two of their team members go up against each other. Each contestant performed a song of their choosing while their opponent watched from the sidelines. One person from each of the pairings got the boot. First up were Devyn Delora and Laura Vivas. Delora took on Whitney Houston's "I Have Nothing," and Vines sang Marc Anthony's "I Need to Know." Aguilera told the contestants, "I want to see who can deliver a powerful performance under pressure." Coach Cee Lo Green told Vivas she was "caliente," calling hers one of the best performances. Shelton liked that Delora took a risk by doing a Houston song. Aguilera apparently agreed and chose Delora to move forward. Adriana Louise and Celica Westbrook were Aguilera's next competitors. Louise sang Kelly Clarkson's "Already Gone," and Westbrook tackled Justin Bieber's "Never Say Never." "Another tough decision," host Carson Daly said. Aguilera told Louise that it was her best performance yet. Alessandra Guercio attempted Rihanna's "Take a Bow," and Dez Duron took on Lionel Richie's "Stuck on You." Neither of their performances was overwhelming, but it seems that Duron's charm won Aguilera over; he advanced. Chevonne sang Billy Idol's "Dancing with Myself" and De'Borah sang The Fray's "You Found Me" in the next knockout round. Perhaps a battle of the contestants with single names? Aguilera was won over by the heart and soul that De'Borah poured into her performance. So De'Borah will live to see another day on "The Voice." Aquile and Sylvia Yacoub competed in Aguilera's final knockout round. Aquile sang Bruno Mars' "Grenade," and Yacoub took on Aguilera's "Fighter." "That's hard to do," Aguilera said about Yacoub performing one of her songs. She ended up keeping Yacoub. "I've got five amazing people on my team and they're going to rock," Aguilera said. Shelton's competitions kicked off with two country singers: Gracia Harrison and Liz Davis. Harrison sang Aerosmith's "I Don't Wanna Miss A Thing," and Davis performed Miranda Lambert's "Gunpowder and Lead." Shelton said he was confused by Harrison's song choice and he liked Davis' edgy touch, so he went with Davis. Next Shelton has to choose between to rockers: Rudy Parris and Terry McDermott. Parris sings Chris Brown's "Forever," and McDermott sang "Maybe I'm Amazed" by Paul McCartney. Both performances were good, but the coaches seemed to agree that McDermott was the better performed; he advanced. Collin McLoughlin battled against Michaela Paige in the next knockout round. McLoughlin sang The Script's "Breakeven," and Paige did a version of Pat Benatar's "Love is a Battlefield." "It comes down to what I'm into the most. I love this little girl so much," he said when choosing the 16-year-old Paige. Julio Cesar Castillo sang Justin Bieber's "Somebody to Love," and MarissaAnn sang Patti Labelle's "Lady Marmalade." Shelton praised both singers, but decided to go with Castillo. Cassadee Pope competed against Suzzana Choffel in the final knockout round of the night. Pope sang Maroon 5's "Payphone," while Choffel took on Bob Marley's "Could You Be Loved." The coaches, including Shelton, are impressed with Pope's performance. She got to advance. "I really think we have the most diverse team," Shelton said. "I really think I could win this thing again, I do. "The Voice" returns Monday with "Live Play-offs, Part 1," when two coaches' teams will lay it all on the line in a live episode that will allow viewers to vote. The episode will also feature new co-hosts Mario Lopez and Khloe Kardashian.